Seafood industry leaders are increasingly focused on their responsibilities to the people and communities they work with. But when it comes to understanding these social issues, assessing the risks, and taking preventive or corrective action, many don’t know where to start. Beyond slavery, what “social issues” should we be concerned with? For each social issue, what does good – and bad – performance look like? What standards or tools can businesses use to assess their risks and improve performance? 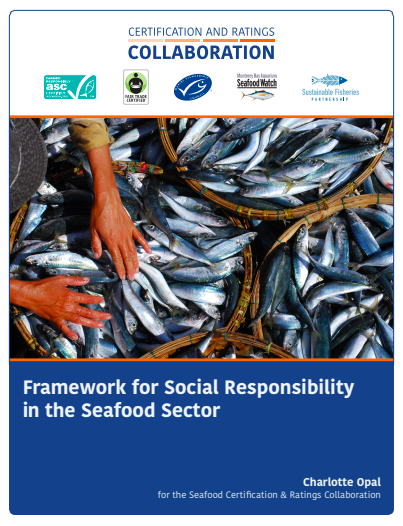 Like environmental issues, social issues are a responsibility and a risk for every seafood business. And like environmental issues, improving performance on social issues builds stronger, more resilient businesses. Understanding where to start and where they need help is the best way to help industry move from concern to action and accelerate the pace of change. We hope industry leaders and their NGO partners will use the Framework to explore how they can incorporate social issues into sustainability commitments. The Collaboration welcomes feedback, comments, or suggestions on the Framework, which will be revised annually. Please email your feedback via the Contact Us page.